Can't make up your mind? Love all our Wines? Then the Surprise Me Club is for You! Receive three bottles of Adirondack Winery Wine of our selection, four times per year! You'll receive a mix of wine varieties in each shipment. *A Free Bottle of your Choice arrives with your FIRST shipment as our welcome to the club! Is this a GIFTED Wine Club Membership? If so, in the "CLUB NOTES" section on this page, please note how many installments you would like to pay for. *Must agree to gift at least two installments for club member to hold member benefits. Once your gifted installments end, we will give the club recipient the option of continuing or cancelling their membership on their own. FREE Wine Tastings for you & 3 guests (limit 1 session per month) at our Lake George Tasting Room. Four (4) Club Member events at the Tasting Room per year Including: FREE Upgraded Tastings, Surprise Giveaways & More! Valued Club Member Treatment: We do our BEST to make time & space for you at the Tasting Room when you use your club perks. Exclusive Club Member Phone Extension. Receive New, Limited Edition and Soon-to-be discontinued wines in your club installments! Wine Club Newsletter w/ Wine Details, Upcoming Events, Recipes & More! FREE Bottle of wine in December shipment when you stay enrolled for more than one year! By signing up for our wine club, you agree to have your credit card automatically charged the selected club purchase amount (PLUS $12 SHIPPING if chosen) once every quarter. Minimum Club Installment Commitment is for TWO (2) Installments. Credit card charges will occur and club installments are ready during the first week of March, June, September and December. New members commit to being a member for a minimum of two club installments. Club Membership automatically renews unless you notify us that you wish to cancel. Cancellations are accepted up to one day prior to the first of each club installment month (Mar. 1, June 1, Sept. 1, Dec. 1). After the first two club shipments have been sent, your club may be placed on hold for a period of up to one year. While your club is on hold, club member privileges will not be available to you. The type of wine club membership may be changed at any time; shipments already sent will NOT be refunded. 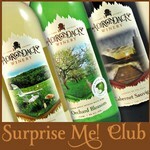 Adirondack Winery reserves the right to change wine club membership privileges and pricing at any time.